Pathfinder Society San Antonio is HEREEEEEE! Hello! My name is TJ and I am a Venture Agent for San Antonio's local Pathfinder Society Chapter! 6:01 pm-7:00 pm: Silverhex Chronicles- Mausoleum, We Be Goblins! 7:01 pm-8:00 pm: Silverhex Chronicles- Mists, We Be Goblins! 8:01 pm-9:00 pm: Silverhex Chronicles- Colony, We Be Goblins! 9:01 pm-10:00 pm: Silverhex Chronicles- Crash, We Be Goblins! 10:01 pm-11:00 pm: Silverhex Chronicles- Webs, We Be Goblins! 11:01 pm-12:00 am: Silverhex Chronicles- Silverhex, We Be Goblins! We will provide everything you need to play from dice to a pre-made character. "The Silverhex Chronicles" and "We Be Goblin!" can ONLY be played with pre-made characters (Silverhex can be played with any 4 of the normal pre-generatated characters (called "pregens") and We Be Goblins! is played as 4 evil goblin pregens). For "Masters of the Fallen Fortress" and "the Confirmation" we can seat up to 7 players who are playing their own PFS registered characters (level 1 or 2) as well as people playing pregen characters. The rules and resources you need to make a Pathfinder Society legal character can be found in the free Pathfinder Society Roleplaying Guild Guide and the Additional Resources documents. You can even get your own Pathfinder Society number and preregister your characters here to play at PAX and with your own local PFS chapter! What do I get for playing and registering for Pathfinder Society? For those who register on Paizo and provide us with a PFS number and character number, we will be reporting all the games played, so that your registered character will receive proper experience and gold as well as the Chronicle sheet to note that you have done so! In addition to that, we are HOLDING A RAFFLE! Prizes will include 3.5 books, map-packs, dice, and miniatures. If you register for Paizo's website, each separate portion of the Silverhex Chronicles you play will get you 1 ticket (up to six total). In addition, you can receive four tickets for each full module or scenario you play ( i.e. Masters of the Fallen Fortress, We Be Goblins!, and The Confirmation). So, if one were to play all 6 parts of Silverhex and all 3 of the full-length modules, they could receive a whopping 18 tickets in the raffle! Also you will get to have a fun time! I really want to attend this panel! What can I expect time wise for the various games? Hey, we understand PAX is a fast-paced con. The Silverhex Chronicles can be played in any order you choose so if you have an hour to kill till your next panel and then 3 hours after that, it'll be there still. In addition, our GMs are going to very flexible in allowing folks to pop in late to a table, or leave and comeback. Don't worry, we'll provide credit for you so long as you attend a good portion of the scenario or module (GM discretion). The full length modules (We Be Goblins!, Masters of the Fallen Fortress, and The Confirmation) take between 4-5 hours to complete. Again, so long as you are there for the majority of the game, you will receive credit for reporting and for the raffle! Where and when can I sign-up for a scheduled game? I'm a Pathfinder Society player already and I want to know how and how much credit will be applied to my characters? The Silverhex Chronicles works differently from most scenarios you'd be familiar with as it is built as a demo for conventions. The six parts of the Silverhex Chronicles don't give separate chronicle sheets, but rather one chronicle that gives more rewards for each part you complete. If you have played the entirety of the Silverhex Chronicle before, don't worry it! It is an evergreen replayable scenario, the only stipulation is that credit cannot be applied to the same character twice, so the chronicle must go to a character that doesn't have credit for Silverhex already. In total, Silverhex will provide 1 xp (out of the the three needed per level) and 1 prestige point (there is no option for a second). "The Confirmation" and "Masters of the Fallen Fortress" are normal evergreen scenarios that can be replayed with the same stipulations as Silverhex. You get 1 xp and 2 prestige points for the Confirmation and 1 xp and 1 prestige point for Masters of the Fallen Fortress (despite it being a full module it only gives 1 each). "We Be Goblins!" is the only non-evergreen scenario we are running. If you have played if before, you cannot play it again without using a GM star replay. It also gives 1 xp and 1 prestige point. What info do I need to register for Pathfinder Society? Name, Email, DoB. We will have someone to walk you through the process. It takes a total of 2 or 3 minutes if even that. We are a family friendly group! Feel free to bring yourself and the kids by for some family monster slaying! Our GMs also aren't out to murder your face off! What is a "Pregen Battle Royale? We decided to celebrate the end of PAX with some fun! The pregenerated characters are mostly built to provide players with a number of different aspects of a class to see if they like them and not necessarily for effectiveness. In other words, they aren't the best characters around (though believe me, they can be fun to play)! We decided that Gorum, the god of war on Golarion (the Pathfinder world setting), would summon all the pregens to his battle arena to see WHO IS THE MIGHTIEST OF THE LEAST MIGHTY! There is no reward or benefit for playing this other than being you know, the champion of a fictional god of war and... a MUFFIN! 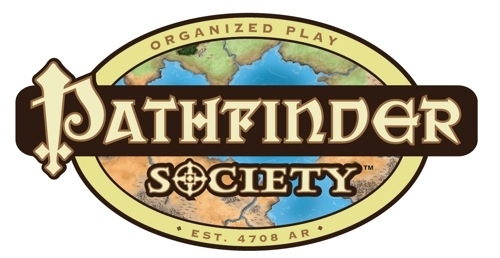 On behalf of the Pathfinder Society of San Antonio, we thank you for playing! So happy to see this!! "Equity for the meek through perseverance and strength!" Revision to the schedule the new schedule is as follows so that we could save on maps! Q: What is the most beginner friendly scenario on the schedule? A: All of the settings are very beginner friendly. However, for someone that has never played before at all, any of the Silverhex Chronicle Quests are the best place to start. They're designed to demo pathfinder and teach new players. Q: Do I have to register for Paizo to play? A: Not at all! Though it is preferred. We cannot apply credit to your character unless you provide us with a Pathfinder Society number with which to report the game to. You also cannot use your own character unless it's registered on paizo! Q: What is the minimum number of people I need to play any scenario? A: 3! 3 players! Ah ah ahhhh! Though if our third fellow who is helping register people for Paizo isn't too terribly busy, he or she will jump in if you just have 2. Q: What pregenerated characters will be available? For the Silverhex Chronicles, all of the classes from the core rulebook will be available (barbarian, bard, cleric, druid, fighter, monk, ranger, paladin, rogue, sorcerer, wizard) . "Masters of the Fallen Fortress" has available the the classes from the Advanced Player's Guide (alchemist, cavalier, inquisitor, oracle, summoner, witch) in addition to characters people created with PFS rules. "We Be Goblins!" has 4 unique goblin pregenerated characters: a rogue, a fighter, a cleric, and an alchemist (they all even come with their OWN SONG!). "The Confirmation" will have the core classes available in addition to player created characters.